Long gone are the days of boring and mundane baby clothes. Your newborn has his or her own personality, so it's only appropriate to dress the little guy or gal in expressive baby clothing. Whether you're a newborn stylist prepping for photo shoots or a DIY mama with a vision, dressing your infant in fashion-forward designs is easier than it has ever been. When it comes to baby boy clothing and newborn girl products, there are many infant clothing stores to choose from. However, not all of them offer a wide selection of preemie baby clothes. The trick is the clothing has to combine cuteness with comfort. 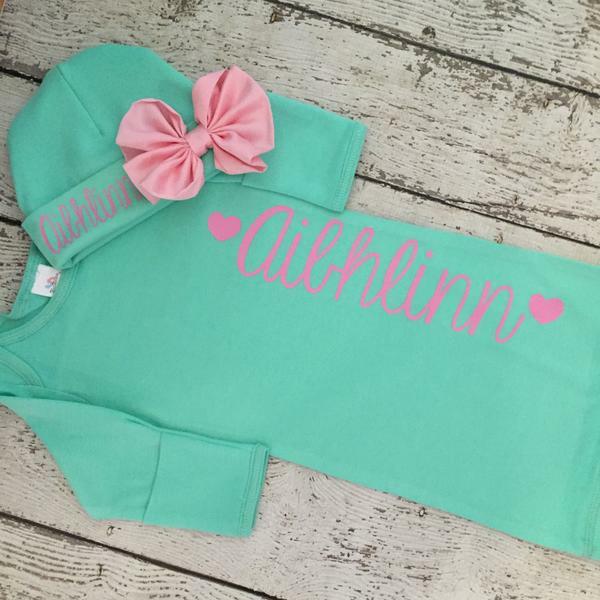 Check out 2 of our favorite preemie fashion trends of the season! If choosing newborn girl products to dress your pretty princess in before her first photography session, you definitely want to pick up a big bloom headband. Stretchy enough to provide a comfortable fit yet decked out with a large floral accent that grabs attention, a flower headband is a must-have for any girly girl's wardrobe. Pink is of course a preferred color for little ladies but you can also order flowery headbands in a variety of other colors. Worried about exposing your premature baby to wind or cold? Can't find stylish newborn caps? No problem. These are common worries and complaints among parents of preemies. This is why it's recommended you stock up on cozy onesies designed for their unique needs. But not just any plain preemie jumpers will do. To have your tiny tot sporting his or her stuff, opt for a designer-inspired jumpsuit that comes with a matching beanie hat. Whether welcoming baby home from the hospital or getting his or her wardrobe ready for an upcoming occasion, we are proud to offer a collection preemie baby clothes that is sure to include what you're after. Our creative designs put other infant clothing stores to shame! Click here to experience Newborn baby bliss. Every color of the rainbow! What’s your favorite?? #shophandmade #newbornphotography #newborn #personalizedgifts #babyshowergift #babygift Like and comment on our posts for a chance to win a $10 credit to our shop every week! Little milkaholic! 😍😍😍 #shophandmade #newbornphotography #newborn #milkaholic #personalizedgifts #babyshowergift #babygift Like and comment on our posts for a chance to win a $10 credit to our shop every week! New Baby Boutique. Picture Window theme. Powered by Blogger.